Radon and its short-lived decay products in dwellings represent the main source of public exposure to natural radiation, contributing nearly 50% of the global effective dose to the population. The naturally radioactive noble gas 222 Rn is present in the air outdoors and in all buildings, including in workplaces. It is thus an inescapable source of radiation exposure both at home and at work. Soil is considered to be the main source of indoor radon concentration, although building materials (especially quartz, cement, etc.) can make a significant contribution to the level of natural radioactivity in closed spaces such as stores and badly ventilated dwellings. Radon gas can diffuse easily out of the soil into the air or into houses. It can get trapped in poorly ventilated dwellings and its concentration can build up to high levels. Inhalation of alpha particles from 222 Rn and associated ionizing decay products are known to cause morbidity in humans. Recent researches on natural radiation exposure have recognized 222 Rn and its progeny inside houses as a worldwide problem and a significant risk factor for lung cancer  It has been estimated that an increase in radon concentration of 100 Bq/m 3 is associated with approximately a 16% increased chance of developing lung cancer. Literature reports of the absorbed doses to lung varies from 5 to 71 nGy/ (Bq h/ m 3 ) and is summarized in Table 26 of the UNSCEAR 2000  report. The central value, which is estimated to be 9 nGy / (Bq h /m 3 ), was used for calculating the range of the internal effective dose equivalent rate for the population. For calculating the effective dose equivalent rate, the radon concentration measured in these offices was multiplied with the equilibrium factor (F) of 0.4 to convert it to the equilibrium equivalent concentration of radon. It is of great importance to assess the exposure to 222 Rn and its progeny in dwellings, especially houses, offices, and schools, for the purposes of quality control. In this context, our group is actively involved in carrying out measurements of indoor radon levels. During the past two decades, many investigators in different countries have studied indoor radon levels. ,, There has been an increase in the number of studies being carried out in normal workplaces such as schools and offices. , To the best of our knowledge, no systematic study has been performed in Nigeria that has investigated radon levels in offices using CR-39 nuclear track detectors; however, some data has been published on radon levels. The aim of this work was to determine the radon concentrations in 24 offices in Nigeria's oldest university campus using, for the first time, CR-39 track etch detectors. With this study we also aimto create interest and increase public awareness about the radon hazard in the community. The University of Ibadan (UI) is the oldest university in Nigeria. It is located in Ibadan, one of the three largest cities in Africa. The university has been functioning from its current site since 17 th November 1948 and can boast of a very well-laid out and serene campus environment. 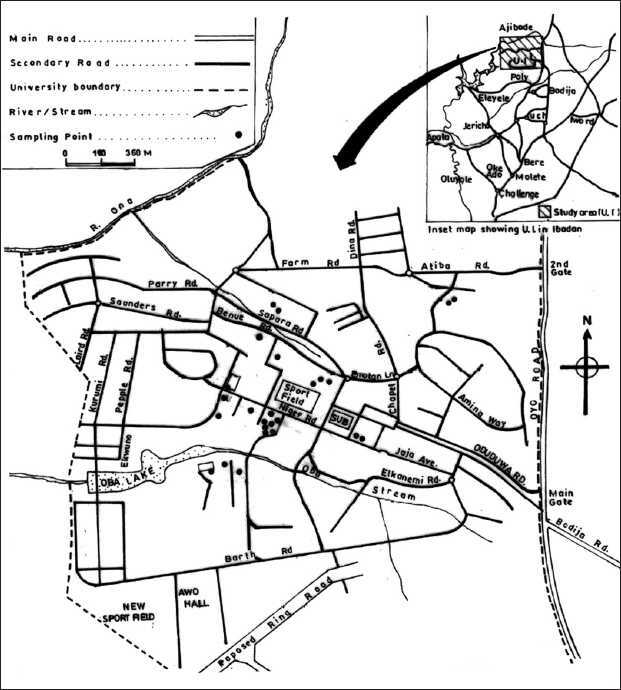 The map of the UI, including the sampling points, is shown in [Figure 1]. Our survey of radon concentration in the campus to estimate the effective dose to the public from 222 Rn and its progeny was limited to 24 offices chosen randomly from among 15 departments because of the limited number of detectors that we had and also due to the difficulty in placing the detectors in various offices. 222 Rn concentrations in dwellings depend on meteorological and geological conditions, lifestyle, construction materials, and ventilation. A questionnaire was developed and filled in by our group for every office surveyed, the information being provided mainly by its occupant(s). Apart from office identification data (occupant's name, address, numbers of years spent in the office, etc. ), the following information were obtained: floor level, wall material type, typical covering materials on internal building surfaces, year of building construction, number of smokers and number of cigarettes they smoked per day, source of tap water, floor type, presence of air conditioners, ventilation, and the underlying soil type. where, A Rn is the 222 Rn concentration (Bq /m 3 ), F is the equilibrium equivalent concentration (ECC) factor for indoor exposure (0.4), O is the occupancy factor, T is the number of hours in a year (8760 h /y), and DCF is the dose conversion factor [9 × 10 6 mSv/ (Bq h /m 3 )]. All these factors, except A Rn, are given in the UNSCEAR report. According to the mean working hours of the occupants (8 hours a day), the occupancy factor for the indoor radon exposure was estimated to be 0.2, which is the same as the occupancy factor for the outdoor exposure to terrestrial radiation in the UNSCEAR report. The values of annual effective doses thus calculated for radon inhalation by the inhabitants were found to vary in the range 0.99-3.12 mSv/ y, with a mean of 1.85 mSv /y 1 [Table 1]. These values are higher than the mean value of 0.049 mSv /y 1 that was estimated to be the effective dose due to soil radioactivity in Ibadan. Therefore, the risk from radon is found to be higher than that from (outdoor) terrestial radiation. Nigeria, in common with other African countries, has not yet formulated national directives to enforce radon limits in dwellings and workplaces. There is no general awareness or factual knowledge about radon and its health hazards. Radon concentrations were found to be moderately high in some of the offices surveyed due to the poor ventilation system and the covering used in the offices, e.g., carpet, linen, etc.. Most of the offices (62.5%) had paint as the covering material for the walls and ceilings and carpets for the floors. The second most common combination (29.2%) was paint for the walls and ceilings, and ceramic tile for the floors. In the remaining offices (8.3%) paint was used as the covering material for walls and ceilings, with linen used as the covering for the floors. These are hereafter referred to as combinations (A), (B), and (C). The radon concentrations for offices with different covering materials for walls, ceilings, and floors are presented in [Table 2]. The average radon concentrations in the offices with combinations (A) and (C) were about the same, while the radon concentration for combination (B) was a little higher than that for (A) and (B). A person working in an office with combination (B) is estimated to receive an average annual effective dose higher (about 0.04 mSv more) than one working in an office with combinations (A) and (C). The authors greatly appreciate Professor Gianrossano Giannini and Dr Massimo Vascotto, both of the University of Trieste, Italy, for the supply of the CR-39 detectors used for radon measurements in this study. They are also grateful to the occupants of the offices surveyed in UI for their kind help and cooperation during the measurements. The first author thanks the Abdus Salam International Center for Theoretical Physics (ICTP). 1. UNSCEAR. Sources and Effects of Ionizing Radiation. United Nations Scientific Committee on the Effects of Atomic Radiation. UNSCEAR Report to the General Assembly with Scientific Annexes A/AC - 82/R 441. 1993 113 - 120. 2. ICRP. International Commission on Radiological Protection. The 2007 Recommendations of the International Commission on Radiological Protection. Oxford and New York: ICRP Publication 103, Ann, ICRP 37, Pergamon Press; 2007. 3. Darby S, Whiteley E, Silcock P, Thakrar B, Green M, Lomas P, et al. Risk of lung cancer associated with residential radon exposure in South-West England: A case control study. Br J Cancer 1998;78:394-408. 4. Darby s, Hill D, Auvinen A, Baros-Dios J,M, Baysson H, Bochicchio F et al. Radon in homes and risk of lung cancer: Collaborative analysis of individual data from 13 European case-control studies. BMJ 2005;330(7485):223. 5. UNSCEAR. Sources and Effects of Ionizing Radiation. United Nations Scientific Committee on Effects of Atomic Radiation. UNSCEAR 2000 Report to the General Assembly, with scientific annexes, vol. 1, 2000. 6. Rahman S, Faheem M, Rehman S, Matiullah. Radon awareness survey in Pakistan. 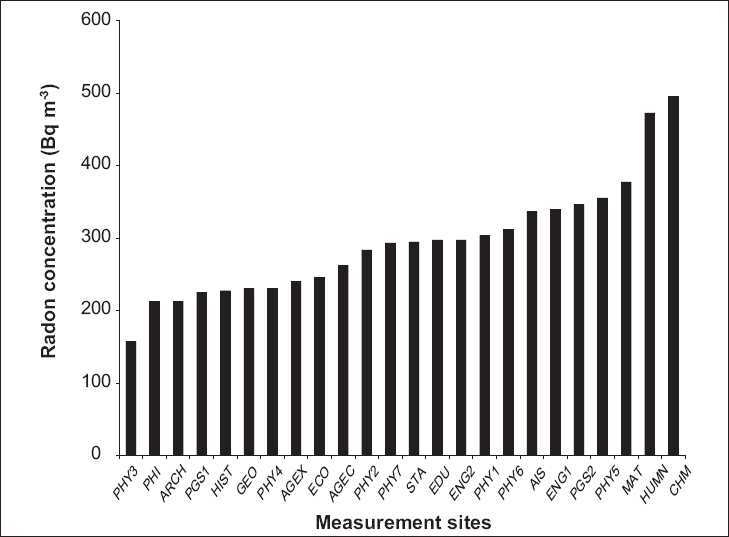 Radiat Prot Dosimetry 2006;121:333-6. 8. Virk HS, Sharma N. A survey of indoor radon and thoron levels in dwellings in Himachal Pradesh, India. In: Bukart W, Shorabi M, Bayer A editors. Proceedings of Fifth International Conference on High levels of Natural radiation and Radon Areas: Radiation dose and health effects. Munich, Germany, 4th -7th September, 2000. p.193. 9. Gooding TD, Dixon DW. Radon in UK workplaces. Radiat Prot Dosim 1992;45:187-9. 10. Oikawa S, Kanno N, Sanada T, Abukawa J Higuchi H. A survey of indoor workplace radon concentration in Japan. J Environ Radioact 2006;87:239-45. 11. Farai IP, Sanni AO. Year-long Variability of 222 Rn in a ground water system in Nigeria. J Earth Sc 1992:399-403. 12. Orlando P, Trenta R, Bruno M, Orlando C, Ratti A, Ferrari S, et al A study about remedial measures to reduce 222 Rn concentration in an experimental building. J Environ Radioact 2004;73:257-66. 13. United States Environmental Protection Agency. Indoor radon and radon decay product measurement devise protocols. EPA 402-R-92-004. Washington, D.C.: U.S. Government Printing Office; 1992b. 14. Obed RI, Farai IP, Jibiri NN. Population dose distribution due to soil radioactivity concentration levels in 18 cities across Nigeria. J Radiol Prot 2005;25:305-12. 15. United States Environmental Protection Agency. Radon measurement in Schools EPA 402-R-92-014. Washington, D.C.: U.S. Government Printing Office; 1993. Obed, R.I., Ademola, A.K., Ogundare, F.O. Obed, R.I., Ademola, A.K., Vascotto, M., Giannini, G.